The Williams FW40 was named after the team's 40th year in Formula One, hence skipping the expected FW39 identification number. The car was revealed online with several pictures on 25th of February before starting winter testing at Circuit de Catalunya 2 days later. The car was designed under the leadership of Pat Symonds, even though he left the team at the end of 2016. The team's long term head of aerodynamics, Jason Somerville, also left the team towards the end of the year, having faced a lot of criticism on the aerodynamic performance of the FW28. 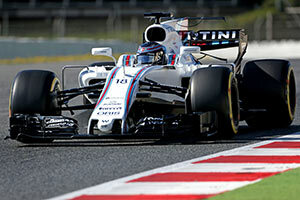 In order to be quick out of the blocks, Williams noted at the time of the launch that it expected that understanding the new wider tyres quickly would be crucial to be, and stay, competitive. The team increased its effort in this area which it hoped would give them a good understanding of the new, more durable rubber. The driver line-up changed as well, with the team seemingly set on a Bottas - Stroll line-up, until World Champion Nico Rosberg vacated his seat at Mercedes AMG F1. That team requested Bottas' services, which triggered Williams in calling Massa back out of his retirement from F1. When the car ended up on track for testing, it was visually extremely similar to its predecessor. Apart from its adaptions to a large overhaul in the aerodynamic regulations, the sidepods were of similar shape, as was the nose cone and front wing. The barge board area that allowed a lot more freedom under the 2017 regulations was also moderately exploited. Its performance in the first test wasn't mind blowing either, with Stroll's difficulty to manage the car compounding to the team's problems. A crash on the second day of testing prevented further running due to lack of a spare front wing, while the next day, another crash created a crack in the chassis, forcing the team to skip the final day of the first week of testing. The second week of testing was a lot more productive for Williams, with the FW40 topping the speed trap repeatedly and Massa often ranked among the fastest. The team's Rob Smedley also went on record to state the team intentionally chose a simple aerodynamic platform. An easier to understand solution following the team's difficulty to get some upgrades on the FW38 to work.